9/11 WTC Debate: Collapse by Fire? or Explosive Controlled Demolition? March 6, 2011 in Boulder! Colorado 9/11 Visibility is pleased to announce a live debate addressing the collapse of the three World Trade Center buildings on September 11, 2001. 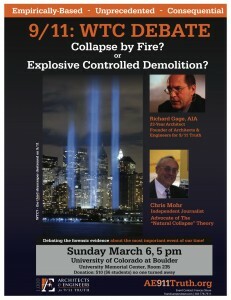 Sunday afternoon, March 6th, at the Boulder campus of the University of Colorado, Colorado 9/11 Visibility will host a debate between Richard Gage, AIA (American Institute of Architects), and Chris Mohr, Denver investigative journalist and nondenominational minister. 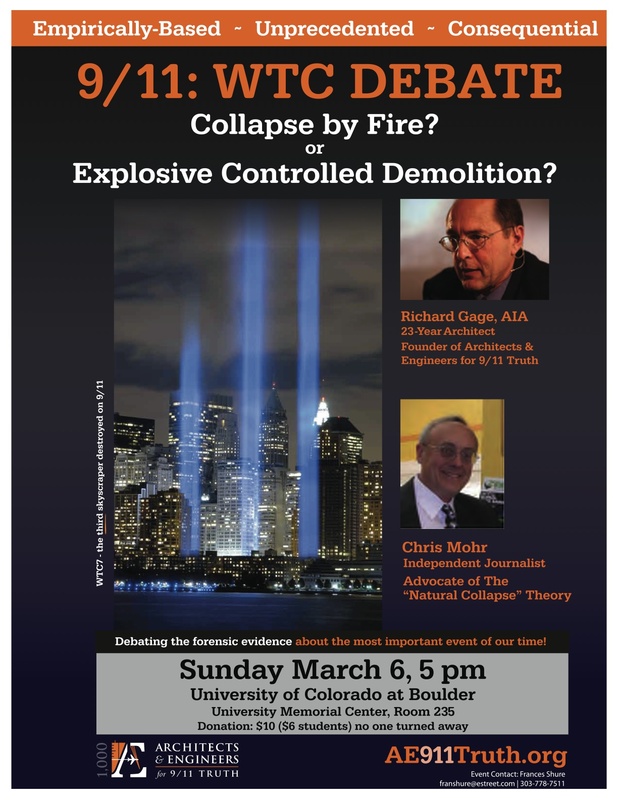 In the upcoming March 6th debate with Richard Gage, the discussion will explore not only the collapse of the twin towers, but also that of 47-story World Trade Center Building 7, which collapsed completely at 5:21 pm on 9/11/01. For those of you not familiar with the collapse of WTC7, this is a riveting, don’t-miss controversy. We look forward to a dynamic, respectful, and thoroughly informative exploration of these topics. This is a rare opportunity! Please send this announcement to your contacts and invite them to join you at the debate, in particular those who would be especially interested in hearing both sides of this controversial issue. We believe that both sides debating respectfully, yet passionately, will have a strong impact in making “what happened on 9/11″ a legitimate subject for public discourse. Therefore, due to the importance and uniqueness of this event, Colorado 9/11 Visibility has commissioned a professional video team to film the debate and produce a high-quality program suitable for television broadcast, along with a DVD for distribution. We need your help. This is an expensive endeavor, and we cannot continue to do work on this seminal issue without funds. We need donations, both large and small. Determine how important this work is to you and contribute accordingly. Please go here to donate at this website, or send a check made out to Colorado 9/11 Visibility and send to Fran Shure, 1841 S. Sherman St., Denver, CO 80210. We are all volunteers, and your funds will be treated with great respect. To learn more as well as link to the archive of the warm-up radio debate, see the article at Architects and Engineers for 9/11 Truth. Thank you for your interest and for whatever you can do to help! The Colorado 9/11 Visibility team: Fran, Tim, Earl, Marti, Simone, Dorothy, Michael W., and Michael A. No comments ? No interest? I'm running around like crazy trying to get ready to fly out and help with this debate and there isn't even one comment about this debate? Waz up with that, y'all? Anyone know much about Chris Mohr? Anyone want a live audio stream from the debate? The truth shall set us free, but we have to keep working for it. Love is the only way forward, gotta love Colorado truth! LeftWright on Wed, 03/02/2011 - 4:48am. SnowCrash on Wed, 03/02/2011 - 7:55am. Vulich on Wed, 03/02/2011 - 1:11pm. Yeah... that's a classic isn't it. But so what if that were true? That means WTC 7 was demolished wasn't it? That means the entire multi-million dollar NIST investigation is an elaborate, malicious fraud and a lie, on a scale unheard of, protecting unknown entities and destroying various financial records used in ongoing investigations, plus it amounts to insurance fraud. And all that on 9/11. If he's right, he saying he's okay with the above. I'm not, and neither are the victims families. Unfortunately for him, he doesn't get to decide whether or not that would be unlawful or 'worth investigating'. In fact, his implied course of action (doing nothing) would incriminate him in a horrendous, unheard of cover up, had he been in a position to do so. He should meditate on that for a while. SnowCrash on Wed, 03/02/2011 - 2:04pm. We need some help with the live audio stream! ! ! If anyone can come to the event with a laptop and handle the Colorado live audio stream, No Lies Radio will broadcast it. Please contact me directly about this at marin911truth (at) yahoo.com. LeftWright on Thu, 03/03/2011 - 11:12am. I've only just listened to this debate...regardless of the evidence (and obviously I don't agree with Chris Mohr) but the brutal truth is that he crushes Richard Gage here (who appears unconvincing frankly)...how very depressing. Ok I've listened to this again...I might have been a little harsh on Richard Gage but we really need something who can think on their toes and who doesn't sound scripted. Virginia Plain on Wed, 08/03/2011 - 11:01am.